I scanned this picture from the 15th book of Vampire Knight because I like it really much! Then I vectored the character and chair in making an extension (her legs and a foot), changing her dress (added some wheel of white tulle) to make her more elegant (she was on very simple nightgown...). 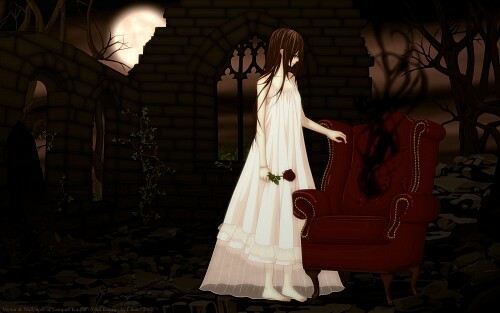 I added a black fog on the chair as if Kaname had just left and a red rose on her hand. She seems to be so sad! For the BG I hesitate sine a long time, tried different versions. I made an inside, but that was not really novel and rather boring, so I chose this version to submit here. I drew and painted a destroyed church, rocks for the floor, some trees and branches, added a painted sky and moon. I really work on the whole atmosphere that I wanted to be both sweet and sad. That's the achievement! I hope you'll like it! I love the background, it definitely helps give off the feeling of loneliness. I also really like the rose she's holding, but I think Yuuki's face looks a bit weird and would benefit from more time to be worked on and more detail when you look at it in full-view.